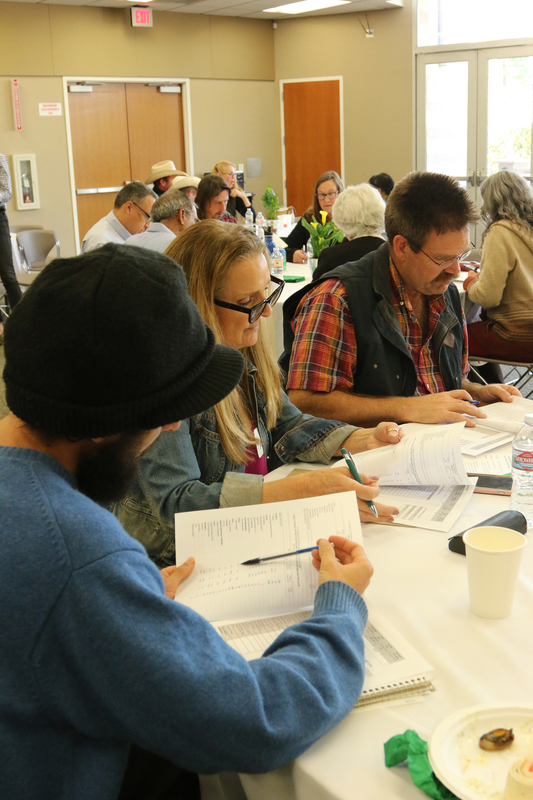 The event was a rare opportunity for farmers and ranchers to discuss financing with a variety of lenders. Participants spoke one-on-one with lenders throughout the day to learn and explore their options. The meeting started with a keynote address by Kate Danaher, a FarmLink board member and senior manager at RSF Social Finance. She spoke about ways people relate to money and how investing in food and farm businesses can contribute to social and ecological well-being. A panel discussion of lenders included the USDA Farm Service Agency, California FarmLink, and Farm Credit, the lead sponsor of the event, featured below. Peer-to-peer learning among farmers is always popular at FarmLink educational events. Alan Haight, retired farmer at Riverhill Farm and FarmLink board member, spoke about the role that borrowing played in building his farm business. He cautioned farmers to avoid underinvesting in their operations, especially in winter and spring when there is the opportunity to invest in a successful season. The event included a hands-on financial activity focused on budgeting for success. With a clear picture of annual budgets, farmers and ranchers are better able to anticipate areas for business investment and how they might impact seasonal cash flow. The day concluded with a panel discussion on alternative models for finance, including speakers from Barnraiser, Iroquois Valley Farms, Sustainable Economies Law Center, and WeFunder. FarmLink named its top sponsor category “Rainmakers” in the midst of the drought. It is a notion filled with hope for the future. This year we are honored that Farm Credit chose to become a Rainmaker sponsor of the Farm Finance Expo through its Farm Credit Alliance. The Alliance consists of cooperatively-owned American AgCredit, CoBank, Farm Credit West, Fresno Madera Farm Credit and Golden State Farm Credit. These organizations are part of the nation-wide Farm Credit System. Farm Credit’s mission is to provide agriculture and rural America with a dependable source of credit. They specialize in financing farmers, ranchers, farmer-owned cooperatives, rural utilities and agribusiness. In many ways Farm Credit is the gold standard of ag lending. Participating in the Farm Finance Expo were representatives from American Ag Credit, Farm Credit West, and Golden State Farm Credit, which was represented by Tod Kimmelshue. Reflecting on his participation, Tod said, “Participating in the Expo allowed Farm Credit to be front and center as a premiere agricultural lender. 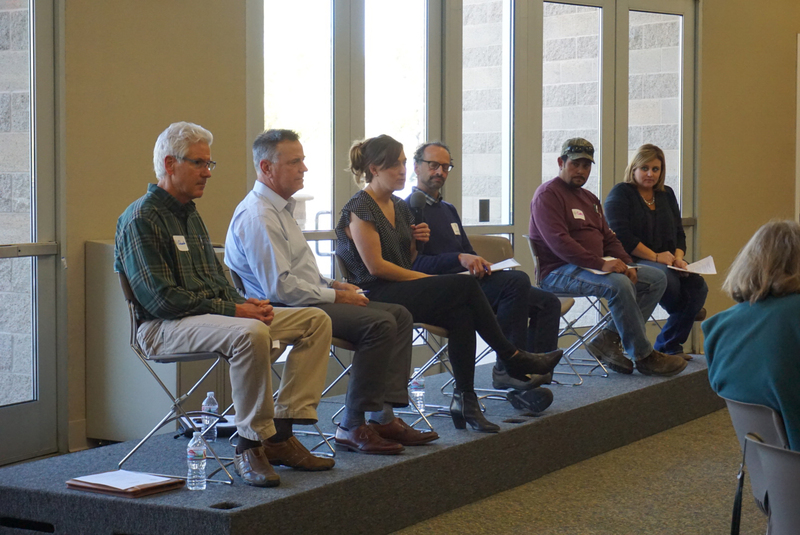 In addition, it enabled us to address questions many farmers have in regards to financing, and build awareness of the opportunities that our Young, Beginning and Small Farmer Program offers.” Questions from farmers included how lenders view the creative business and sales models of smaller farms. The Farm Credit representatives reported that they too can be creative, and help farmers with business plans and financial statements, with a focus on verifying income and credit scores as key factors in their underwriting. Over the last 17 years, Farm Credit has been working closely with Young, Beginning and Small (YBS) Farmers. In 2017 Farm Credit made 74,000 loans to beginning farmers nationwide, totaling $12.5 billion. Each local Farm Credit association has YBS-specific programs and services, and we encourage farmers and ranchers to explore their options. We’re grateful for Farm Credit’s support and look forward to sharing more news of how Farm Credit and FarmLink are working together to invest in the future of California agriculture.